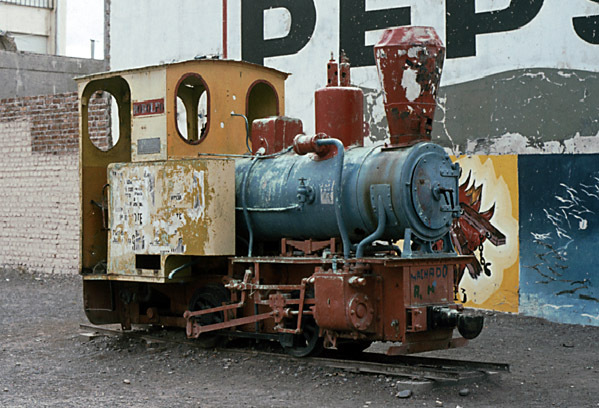 At the back of the Museo Regional in Trelew is an Orenstein & Koppel 0-4-0T, No. 12861 of 1936, as shown left. Gauge is 60cm. It carries a conical spark-arresting chimney and the name 'Rodolfo.' It, with its twin no. 12860, were owned by the Grun & Bilfinger construction company's Argentinean subsidiary. They were used for some time at a dam site in Neuquen province before arriving (in 1948?) at the Florentino Ameghino Dam construction works further up the Chubut valley. As well as these two steam locos the Ameghino Dam works used an O. & K. diesel, no. 21016 of 1937, class RL3 (1). The photo was taken in 1975 when its livery was appropriate to its then location in a playground. Nowadays its colour scheme is a combination of black and rust. 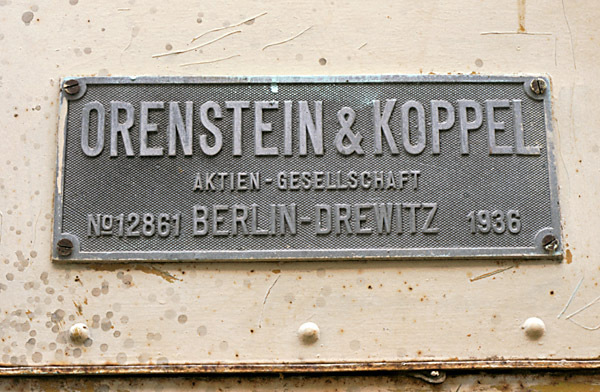 The Orenstein & Koppel worksplate is shown below. The photo below shows a rope-worked incline in use during the construction of the Florentino Ameghino dam (6). The temporary 75cm gauge branch from the FCCC mainline approached across the top of the plateau, behind the photographer. The dam itself was behind the spur of rock to the right. 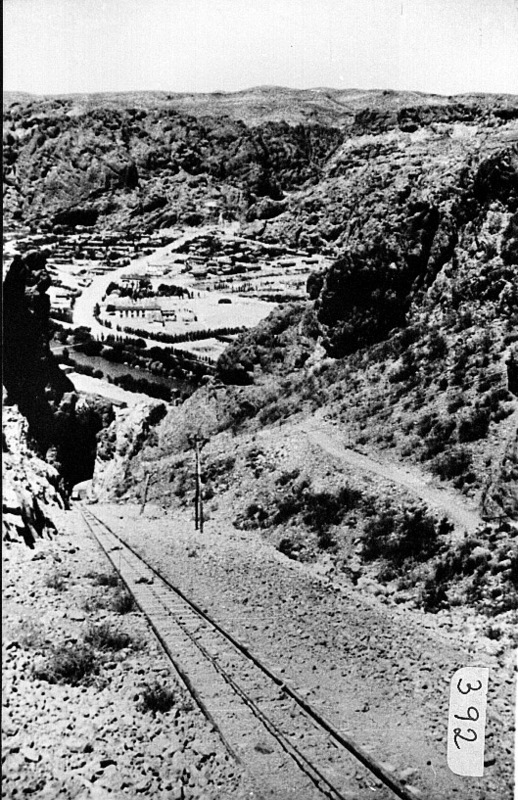 Much of the construction work was based down in the valley and the incline was therefore constructed to lower materials down to the base level. It is surmised that the incline was of 60cm gauge and linked to Messrs Grun & Bilfinger's operations, but this photo does not provide proof of this, as it might be of 75cm gauge. 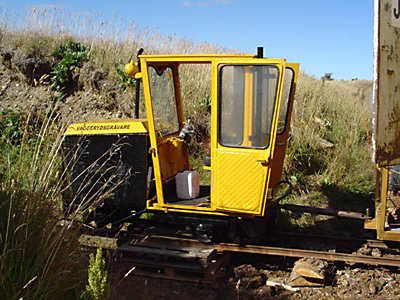 Contractors' narrow gauge systems utilised during the construction of the permanent railways. It should come as no surprise that 'Decauville' type temporary rail systems were used during the building of the broad and 75cm gauge rail network; nor that evidence of such operations is hard to come by. The following photos are evidence of 60cm gauge temporary rail workings during the building of the line from San Antonio Oeste. Orenstein & Koppel 0-4-0T no. 6962, a metre gauge 20HP machine, was delivered to the agents Duncan Fox for Argentinean Patagonia in 1913 (4). It was later sold to the Puerto Bories frigorifico line in southern Chile and is illustrated in the appropriate page of chapter 8. No metre gauge industrial lines are known which existed in 1913 so this was probably in a location yet to be discovered. Alternatively it may have worked on the Mina Loreto coal line described in chapter 9. 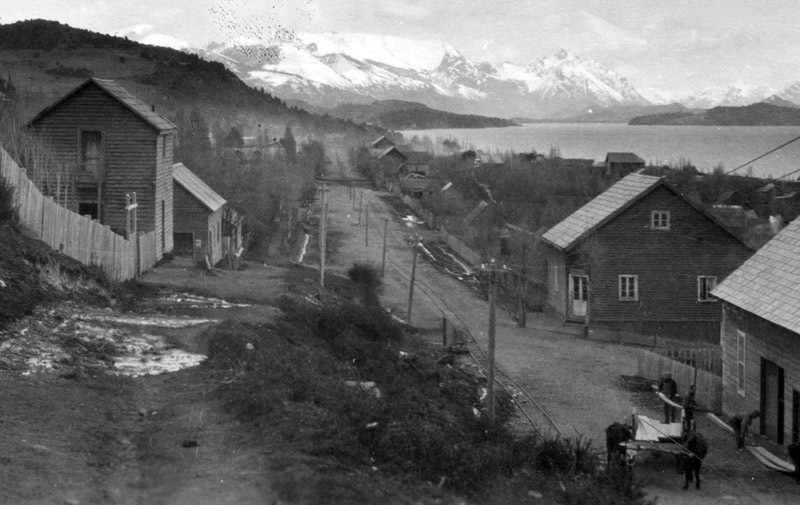 In the extensive Archivo Visual Patagónico's web site we have this view of a street in Bariloche showing a narrow gauge track laid alongside the road. We have no information about its purpose or extent. David Sinclair has pointed out that peat was being extracted commercially from Staten Island off the SE tip of Tierra del Fuego in the 1940s. 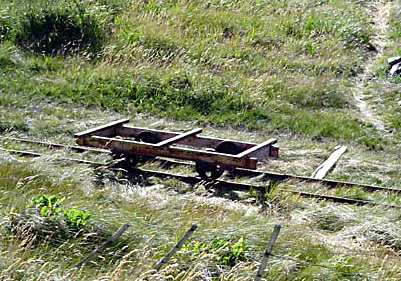 Peat workings, wherever they may be, have been consistent users of narrow gauge railways even up to the present day. Enquiries are continuing! In the meantime the only rails recorded on Staten Island were wooden ones forming a line up which to winch boats at the St. John's lighthouse on the extreme eastern tip (5), and the American sealers' tramway midway along the island. Duncan Campbell of Puerto Natales, who runs the Pat-Brit website, has forwarded photos taken at Río Rubens between Puerto Natales and Punta Arenas. A bog at this location is now being worked using equipment purchased second-hand in Sweden. The operation has been running since the mid-1990s, but the market for the peat is not clear. 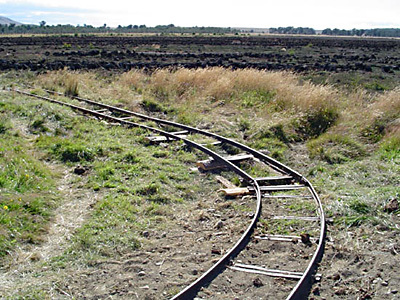 The first picture shows a line running along the edge of the working bog, with a branch leading off into the middle of the workings. The track is of 60cm gauge, in panels imported from Sweden. There seems to be one loco, a small four-wheeled diesel. This is by Vaggarydsgraväre AB of Vaggaryd in Sweden, and is their builder's number 7 constructed in 1985. To quote Eljas Polho of Finland, "The original owner of VG 7 was Sundholm Skog och Torv AB, Järsnäs, Sweden (A peat operation). 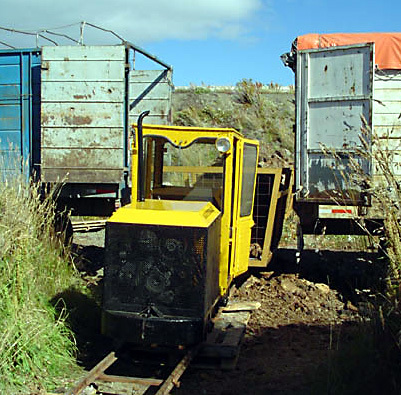 The VG-locomotive was sold to Chile in April 1996, with 3 wagons, 1km of rails and some other peat machinery." Another view of the Swedish diesel. A wagon chassis out on the moss. 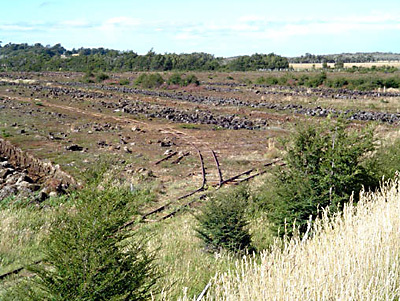 Eljas Polho also gave the information that "Hörle Torv (another peat bog in Sweden) sold 10 wagons and 2km of rails to Chile." but whether this equipment also came to Rio Rubens is not known. A final picture shows the line curving out towards the bog. 4 O. & K. Dampflokomotiven - Lieferverzeichnis 1892-1945 by R. Bude, K. Fricke & Dr. M. Murray, 1978. Railroadiana Verlag. 5 The Gold Diggings of Cape Horn. 1895. J. R. Spears. G. P. Puttnam's Sons, New York & London. p144. 7 Photo from the collection of the Fundación Museo Ferroviario, Buenos Aires. 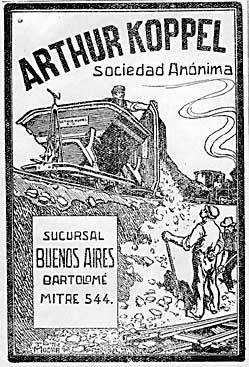 An Arthur Koppel advert from an issue of The Review of the River Plate in 1906.